Sunflower oil contains a large variety of nutrients. It contains a huge amount of vitamin E and fatty acids, which makes it very effective for external use. Make sure you consult your dermatologist and check for allergic reactions, before starting to use the oil for skin care. Use sunflower oil on the damp warm skin, for example after bathing. The oil is absorbed well and the nutrients soak deep inside your skin when it is damp and warm. Sunflower oil can safely be used on the skin under eyes as well as on the extremely sensitive skin. It smoothes the area under the eyes and reduces wrinkles making you look young and fresh. 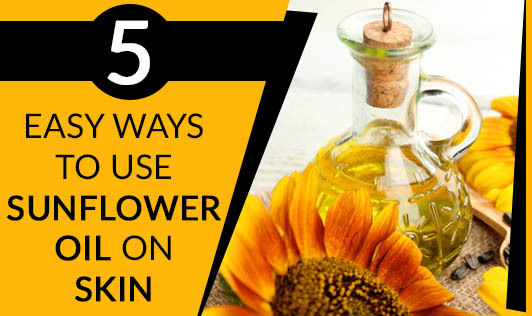 Sunflower oil makes for a good skin soothing potion. All you need to do is, add the oil to your bath. It can be used for massage and lubrication. Sunflower oil can also be used as a diluting base in aromatherapy, as it has a very mild scent and provides a fine feel on the skin. So what are you waiting for? Try this cheap, effective oil today.